This publication is a kind of workbook or manual. It is not a music history, nor is it a technical, musicological book. It is rather a book about materials – musical materials and their relation to other artistic materials. It is not a book for professionals or specialists but for those who like to explore the capacities and possibilities of artistic materials. However, it never talks about them in a technical way. This book is instead about love and desire for old repertoires, and especially for polyphony, attempting to retrace its shape: the initial desire that makes one want to perform this music. Per Margarida Garcia, valgono considerazioni equivalenti dal lato dell'oscurità prodotta: questa specialista del basso elettrico (con estensione su upright bass e double bass) è in grado di formare delle vere e proprie zone di condensazione dei suoni, dei tumulti a latere che lasciano esterreffatti nei loro risultati concreti; qualcosa tra il mistico, il bucolico e una sindrome di potenza. Una veloce ripassata della sua musica può essere fatta sul sitobandcamp dell'artista (dove troverete una splendida collaborazione con Marcia Bassett ed una con sua maestà Thurston Moore), ma il suo recente programmatico solo all'upright bass, registrato a Lisbona lo scorso ottobre, dal titolo Der Bau, non lascia spazio a ripensamenti; continua su una linea iniziata con Mota e Alfredo Costa Monteiro parecchi anni fa e portata avanti con dedizione oggi come musica che indaga gli smarrimenti della coscienza, attraverso gli ampi spazi indotti dall'improvvisazione e dalle attrazioni del momento performativo; sono intuizioni che si notano anche attraverso le ambientazioni delle sue copertine (immagini al limite della luminosità o totalmente annerite con emersione di particolari grigiastri di contrasto). Manuel Mota ist dabei kein Isolationist, vielmehr gehört er zu einer im Fingerspitzengefühlvereinten Bruderschaft mit Noël Akchoté, Ernesto Diaz-Infante, Rafael Toral, David Grubbs...Die ihm wohl vertrauteste Spielgefährtin ist jedoch seit 20 Jahren die Bassistin und Graphik-künstlerin Margarine Garcia, wie zuletzt bei "Crypt" und "Earth Rundown". Der Bau(cdh27) ist nun, nach "So I Put on My Coat and Walked Downstreet", einem Livemitschnittaus dem Hamburger Bahnhof Berlin 2002, und dem in Brooklyn entstandenen "The LeadenEcho" (2012), wieder eine Demonstration ihres Solospiels mit E-Kontrabass. Mit aucheigenhändig der Schwärze abgerungenem hellem Gewölk auf dem Cover und KafkasErzählung ist eine Perspektive suggeriert, die das 'The Mole in Its Burrow'-Kapitel in PeterSzendys "All Ears: The Aesthetics of Espionage" zu reflektieren scheint. Mit der Prämisse,dass das, was den Bewohner des Baus als belauschten Lauscher umtreibt, ein Geräusch ist.Garcia erzeugt mit Bogenstrichen ein stöhnendes Dröhnen, das unaufhörlich changiert undeinen in ein Gewölbe versetzt. Darin kostet Garcia alle Nuancen eines chiaroscurenKnurrens aus. Die teerzähe Düsternis scheint fast selber zu singen und zu raunen mit einemdie Schwärze kauenden kryptischen Riesenkarpfenmaul. Die Saiten surren und grollen,seufzen und ächzen in quallender Licht- und Bodenlosigkeit, sich verzehrend (in derDoppelbedeutung von autophag und to pine away, to chafe, to eat one's heart out). Wonach?Nach Stille, nach Geborgenheit, nach Einklang? 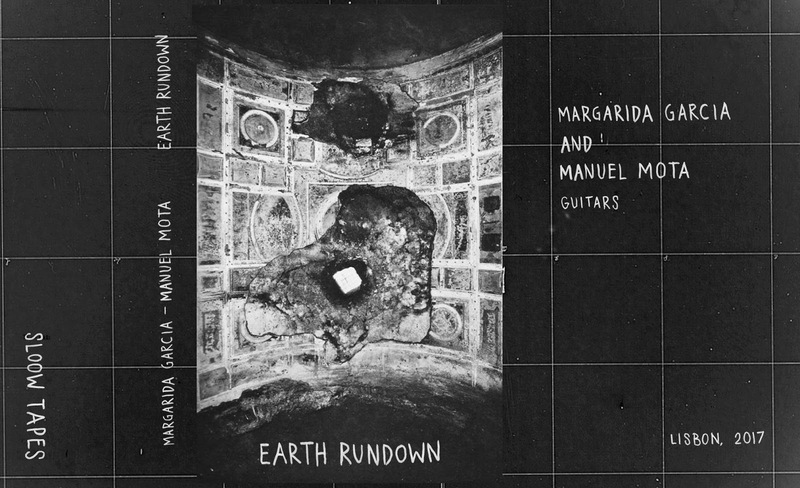 Slowly evolving daydreams of electric guitar shrouded in lo-fi reverb by Margarida Garcia and Manuel Mota. Dark, quiet and mysterious superimpositions floating and spiraling further and deeper in the distant hollow spaces of the void. Artwork by Margarida Garcia. 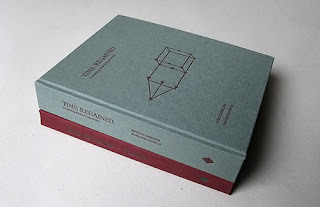 Edition of 70 copies. Interesting this album is titled Cai-Bem. The Portuguese to English translation loosely means goes good or sits well. David Maranha's new full length on Tanuki Records steers far from ambient float and spiritual fluff. These sounds do not sit well and the going is in another direction from good. So Cai-Bem? A smile when it came time to name this or some knowledge yet to be understood by the listening world. Theses musicians have created, or opened is a better term, a small dimensional valve. Noise is elongated and pulled from our reality. A droning epic slipping through a spacial gap too small for so much talent. This creates a sonic environment that is slightly uncomfortable. Like sound is being pulled out of you rather than flowing into your thoughts. Cai-Bem is an oddity with twisted beauty so askew, music scholars will need to investigate. David Maranha gathered multiple hands in the composition of the album. His fellow creators moved in new directions, all playing unaccustomed instruments. This group includes Margarida Garcia, Miguel Abras, Manuel Mota, and of course David Maranha. With organ, bass, shruti box, drums, vocals, and tape manipulation, Cai-Bem is a slow sonic upheaval. High pitched droning mixed with deep cyclic resonating bass. Out of phase percussion keeps the lid from screwing on tight. Like a high pressure leak, the entire listen is in the dangerous red zone of exploding. Thanks to this experienced bomb disposal unit, these sounds let off tremendous energy, with no harm to consciousnesses in close proximity. Aural breath just behind your shoulder, the sound sending shivers, the source shrouded in obscurity. A truly haunting escapade through a black and white negative of Cai-Bem. This is the first full length vinyl release for the Belgium label Tanuki Records. Number twenty eight in the Tanuki catalog. The going will be difficult for future vinyl label releases to equal this metaphysical debut. A completely unique sonic experience. Available from the labels bandcamp page. “Cai-Bem” is a splendid addition to the already extensive discography of David Maranha. It is also the first full-length vinyl LP on Tanuki Records’catalogue. There is a story behind this new album, although you would not guess what it is, unless told. Recorded with his ensemble after a concert they did in Barreiro, a town on the south side of Tagus River, near Lisbon, it is an experiment of sorts. Keen to explore new ways of playing, as he has done during his whole career since he began playing with his band Osso Exotico in the 1980’s, Maranha suggested that they should all play other instruments that their regular ones. He himself switched his organ for the drums, Manuel Mota is on bass, Margarida Garcia on the organ and Miguel Abras on a fostex 4 track tape recorder and voice. From the Berlin‘s Geniale Diletante to the Portsmouth Symphonia of Gavin Bryars, the idea of regaining a fresh relationship with your art by going back to the beginning, to your own starting point as a player, has produced astonishing results. Here, instead of delivering a kind of cute clumsiness or some back-to-basics minimalism, the process seems to have provided them with an expanded concentration, a deepened immersion into the act of playing. All four musicians share a textural approach to their sound, which is here extremely consistent with having to discover a new, unfamiliar instrument. Learning new gestures, replacing the physical memory of movements they were accustomed to perform, enabled them to go beyond technique and skill, and engage music with a new intensity. Crafting their music as acoustic drone compositions, at times shamanistic rituals and at others eternal music in the style of La Monte Young, Maranha and his ensemble play primarily with time. Their compositions are not about inventing new structures every time, but about the paradoxical challenge of building a stasis retaining the forcefulness of a forward motion. In this case the unusual and eerie sounds they coaxed from their newfound instruments adds new layers to the psychedelic power of this great record. For the first time Tanuki Records from Brussels release a full length LP and for this they have one or two new pieces by David Maranha; it depends if you think of a record as two sides of one piece split in two. With this one it is no doubt the latter. He’s best known as an organ player with some exciting loud minimal music, but I first heard him with the more delicate Portuguese group Osso Exotico. For this new album Maranha takes note of Gavin Bryars who said it is good to refresh what you are doing and go back to the beginning, and switch roles. So the organ player Maranha plays drums here, Margarida Garcia organ (normally bass), Manuel Mota on bass (guitar) and Miguel Abras on ‘multi-track magnetic cassette tape deck, voice and shruti box’ (I have no idea what his usual instrument is). I gather they convened together and tape was switched on and they started playing, on in a single day (but perhaps not in a single session). Maranha later spend a few days in mixing this material. There is throughout a sort of drone thing going on, maybe on the large stabs of the organ, whereas the other instruments,bass and drums foremost, are in a free improvised music, going about, whereas the role of Abras is freer than that; he provides some of the weirdo sounds (high pitched, slowed down voices) that float as in free space through these two sides. The drums sound a bit far away and I am not sure if that is an intentional decision from Maranha or not. The mood is quite dark and obscured; like rolling thunder sounded in the distance at night. It is also a bit noisy I guess with that piercing tone lingering on somewhere, and it made me wonder if noise is the original background of Maranha. If so, I didn’t know. This is not really music to aim and please, I think, but something of a well-orchestrated nightmare. Having a set of players tackling tools they’re not accustomed to is a somewhat unsafe proposal. However, Cai-Bem – the newest release by minor legend David Maranha, of Osso Exotico renown – eschews the disasters of disorderly improvisation more or less completely. The duration is that of a classic vinyl LP, around twenty minutes per side. The instrumentation – comprising organ, bass, drums, shruti box and voice – is improved by an object this writer is particularly affectioned to: a Fostex 4-tape cassette recorder, namely the very first means through which he attempted his own “creative” pastiches as a youngster. Needless to say, the old machine is exercised much better here by Miguel Abras, who – conjointly with the leader, Margarida Garcia and Manuel Mota – brings forth a whole cosmos of ectoplasmic sonorities especially typified by noticeable oscillations, persistent acute frequencies and heavy-footed pseudo rhythms. In general, the work contains a high percentage of ritualism. Firm gestural patterns emerge from a gathering of scarcely palpable textures; a valuable recipe for rendering our system of reclusive defense a little unsteady. The muddy mix must not be perceived as a factor decreasing the overall efficiency; on the contrary, the sense of occlusion experienced while listening to the music via headphones was helpful in transforming the current pessimistic visions into pliable substances for an unidentified typology of so-called comfort. We can’t be sure about what’s heard in a given moment; unquestionably, a copious dose of processing and filtering – in addition to a (presumed) manipulation of the speed controls – contribute to an unusual “lucid numbness” that never ceases to shield the listener from external influences. Think Pink Floyd circa Ummagumma covered by Faust, and you’re halfway there. Interesting record. Not one for the ages, but gripping enough to justify several replays. Każdy kończący się rok sprzyja wszelkim muzycznym podsumowaniom i bardzo często pozwala także dotrzeć do albumów, z różnych przyczyn pominiętych lub odłożonych na potem. Kiedy dwa lata temu, pochodząca z Lisbony Margarida Garcia, dała upust swojej wyobraźni we wspólnych gitarowych eksperymentach z Thurstonem Moorem, obiecałem sobie śledzić jej dalsze artystyczne kroki z uwagą. Ubiegły rok przyniósł bardzo interesującą kolaborację z Manuelem Mota, a kończący się zaskoczył jeszcze bardziej, choć niewiele brakowało a o „Limbo” zupełnie bym zapomniał. Wydawnictwo, którego zawartość chciałbym przybliżyć, miało swoją premierę na początku bieżącego roku w szwajcarskim Dead Vox. Czarna matowa kaseta i tak samo ciemna okładka z białym szkicem autorstwa Margaridy, zdradzają posępną zawartość niespełna czterdziestominutowej taśmy. Przy bliższym poznaniu obu stron kasety, noc wydaje się nie tylko ciemniejsza niż zwykle ale i wyjątkowo pochmurna. „Limbo_A” rozpoczyna się od partii bardzo nisko osadzonych, basowych dronów, które po kilku chwilach zaczyna przeszywać wyżej strojona gitara Felizardo. Instrumenty przetwarzane są na różnorodne sposoby, brzmienia gitar łamią się, ogłuszają nagłym zgiełkiem lub basową otchłanią. Szarpnięcia strun wyraźnie pozwalają dominować gitarom pomiędzy sobą, po to tylko, aby po krótkiej chwili nastąpiła kolejna zmiana ról. Nieustająca walka o wyższość gitary elektrycznej nad basem przenika także na stronę B. Zasadniczy trzon zarówno pierwszej jak i drugiej kompozycji, tylko z pozoru wydaje się statycznie basowym i ociężałym wnętrzem potężnego dźwiękowego masywu. Kolejnych przeobrażeń o subtelnym ale konsekwentnym charakterze, jest tu całe mnóstwo. Gitarowy zgiełk roztacza potężne, transowe kręgi i absorbuje uwagę słuchacza w stu procentach. Z pozoru trudno uwierzyć, że funkcjonujące z dala od melodii i rytmu, improwizowane, mroczne kompozycje zawarte na „Limbo”, powstały w słonecznej Lizbonie. Dla wtajemniczonych, to tylko potwierdzenie faktu, że na Półwysep Iberyjski warto mieć oko, muzyka improwizowana ma się tam bowiem wyjątkowo dobrze. Potwierdzeniem tych słów, niech będzie artystyczny dorobek – wciąż aktywnego i nieustannie poszukującego akordeonisty – Alfredo Costa Monteiro, który w przeszłości nagrywał także ze współautorką opisywanego albumu. Można powiedzieć, że jedna z wielu artystycznych współpracy na drodze Margaridy Garcii dopełniła się. Przypuszczam, że studyjne spotkanie z Felipe Felizardo ma charakter jednorazowy, bez większych szans na kontynuację, czy wcielenie koncertowe. Uczciwie przyznać trzeba, że starcie dwóch, doświadczonych osobowości przyniosło w tym wypadku wyjątkowo przyswajalny rezultat. "Limbo" begins with static and guitar darkness. It's somewhere between Nine Inch Nails and something off of "The Crow" soundtrack. It has this vibe to it like something wicked is lurking on the horizon and while that might not be defined there is a certain sense of deep cello bass and abrupt surprise to the music that might suggest anything from an Alfred Hitchcock movie to Godzilla. The notes seem to drop off at times, into the deepest, darkest of places and otherwise there is some whirrs and just other manipulation of sound within here- like Transformers even- but if this is the soundtrack to some movie I haven't seen then, believe me, I certainly do want to see it. On the flip side we start with some footsteps in the basement. It just sounds dark and dank. A ringing grows, it grows so loudly that it almost becomes uneasy to hear. Whether it be that terror creeping up on you in the night or the sound of your screams it's certainly not one of the noises which you will relate with something happy. Guitar notes drop like brimstone. It begins to tick-tock back and forth like Willy Wonka as other distorted notes are seemingly smashed out. I imagine this being as some story of a possessed guitar, bent on evil and killing but I'm pretty sure that happened when they remade "The Twilight Zone" and this is far more disturbing. It's just that I've heard some pretty dark music in my time- the type of things which would send the toughest of goth kids home crying to their mommies- but I'm just not sure I've ever heard a guitar used as such an instrument of destruction as it is here. And the sounds which accompany the guitar (which I've read are made by bass) only serve to enhance that experience. As we draw nearer to the end, the music begins to fight itself and as we all know there is no greater monster out there than the one willing to hurt itself because if this monster will cut off its own face imagine what unthinkable acts it has in store for you. Through the end you'll find yourself in the darkest of places with the deep, dark drone of the bass. It's got this feeling like you're watching a horror movie but one which hasn't been invented yet. I will admit that when I watched "Saw" I liked it, but I liked "Hostel" a lot more, mainly because of that scene where the guy is tied to the chair and cut at the ankles but tries to stand up and walk. Anyway, this feels like a movie that would go above and beyond that and, yes, in a real and actual way not just because it's something attached to a sticker on the packaging. As ominous as it feels, up to that last second which sounds like a droplet of water (or blood), there is still beauty in it and of course large amounts of talent. I do suggest listening to this but only with the lights on. She's the stand-up bassist; he's the guitarist. On Crypt (Yew Recordings), this Portuguese duo scare up what's easily the most fried, disorienting album I've come across this year so far. 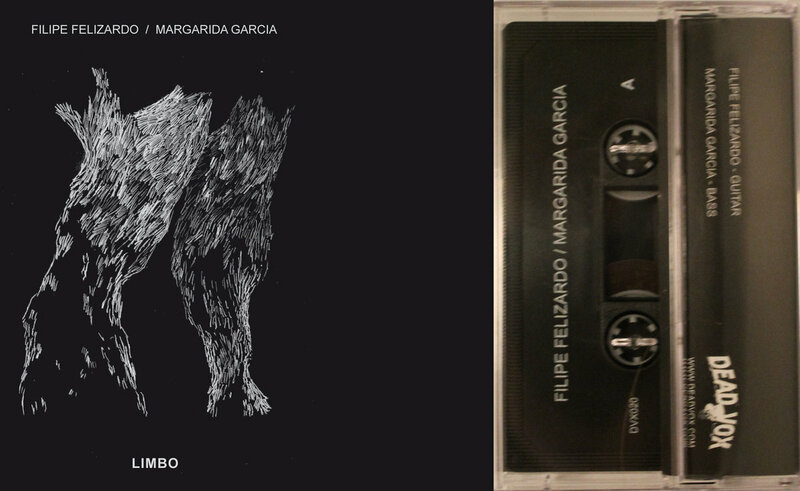 Each player occupies a very specific lane: Margarida Garcia sllllllllowly coaxes deep, robust growls from her bass with a bow, while Manuel Mota traipses through the stratosphere, idly attempting to imitate invoke a celestial sprawl via an electric guitar. Their storm fronts are separate as often as they intersect, but when they do come together, the result is like watching grainy videos of two different slo-mo chemical reactions simultaneously projected on the same wall. Those moments are viscerally uncomfortable in a pleasantly surprising way, as though the improv waltzes preceding were preludes you didn't quite recognize as such. Every gesture arrives shrouded in dry echo; the incidental chatter and background noise crowd Crypt when it goes nuclear and when it is pretending to catch its breath or daydream. Because of this, there's never really a point where the listener can truly find her or his bearing: every sound is roar toil, trouble, cough, whisper, or a ear-singing snarl that's unceasing or balloons out to a brief, unbearable decibel level just before collapsing in on itself. That's the blues, folks. Who would want things any other way? Ah Manuel Mota, the man with his guitar and nothing much else. Well, and Margarida Garcia on bass - upright one, I think. In his solo music Mota is very quiet - see below - But also in his collaborations he is very quiet, but at times also seems to be using a bit more sound effects. Garcia has had a couple of releases on Headlights (Mota's label) before, some solo and one in collaboration with Thurston Moore. I am not sure if she uses any sound effects in her playing. With a title like 'Crypt' I expect it to be recorded in a hollow space, perhaps something such as a crypt. The music is very quiet, but never silent; it meanders about, without goal, without purpose but has an excellent mysterious character to it. It's hard to define what that mysterious character is. A kind of scraping sound, some reverb, something from a far (such as in 'The Candle Indoors'). There is something menacing about this release, something creepy. Maybe Mota uses a bit more sound effects here, mild doses of distortion here and there. Unlike his solo work, in duet with Garcia there is a fine sense of drama, maybe it's even possible to say this is kind of painful, heartfelt blues music? Six pieces here, possibly all recorded in cavernous situations, all live obviously with no overdubs or editing and at thirty minutes a bit too short for my taste; that perhaps was the only downside to an otherwise great release. Intrigante álbum do duo formado por Margarida Garcia (baixo eletrificado) e Manuel Mota (guitarra), Crypt apresenta seis temas de desconcertante morosidade. 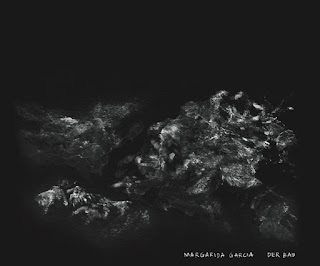 A obscura sonoridade do duo se desenvolve de forma quase letárgica, com o baixo gestando densos tons, entrecortados pelas notas pinceladas por Mota, gerando uma atmosfera sufocante (muito diz a capa do disco!) e hipnótica. Margarida – que no ano passado lançou outro disco em duo com guitarra, daquela vez com Thurston Moore – apresenta uma forma muito particular de lidar com o baixo, tirando com o arco sons por vezes guturais, rosnados sedutoramente sombrios e nebulosos – em “The Candle Indoors”, que fecha o álbum, encontramos esse processo em sua plenitude. Os seis temas se desenvolvem como partes de uma suíte, fazendo mais sentido ouvi-los em sequência. E há, nesse percurso, unidades internas, marcadas pelos pares “Moonless I” / “Moonless II” e “Crypt I” / “Crypt II”. A breve duração do álbum, com cerca de 30 minutos, nos convida a escutá-lo seguidamente, movidos pela expectativa de captar algo que parece oculto: talvez apenas presenciando essa música ao vivo, em um ambiente como uma igreja iluminada apenas por velas, seja possível decifrar essa criação por completo. 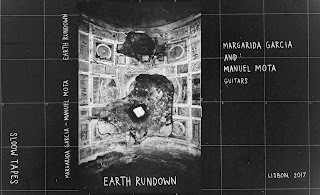 Stunning new limited edition LP on Portuguese avant guitarist Manuel Mota’s private imprint in an edition of only 299 copies that pitches the mile-deep bass stylings of Portuguese bassist Margarida Garcia against Thurston Moore of Sonic Youth’s electric guitar: this is one of the most radically styling of free improvised face-offs from Thurston in an age, with Garcia’s incredible earth-shuddering electric bass stylings evacuating all sorts of doomy sonic sub-spectra that opens up a weird vortex that is part classic guitar-smashing EVOL-style improv, part avant cosmo gobbling ala the tactile string work of Dumitrescu or the early music sawing of a Third Ear Band and part the kinda naked on the lip of the void free jazz drone of the classic Barefoot In The Head side cut with Sauter and Dietrich. Thurston plays in a textural style but with a whole lot of actual bite, drumming up venomous string combinations and hovering over halos of electricity while Garcia sounds like she is burrowing her bass straight through the floor, creating the kinda polmorphously perverse shapes that suggest deep, organic activity. But really this one feels like the between song jams of the EVOL years extended to the point of full free compositional motherlode, with a psychedelic depth that could almost be Tokyo. Love this, beautifully packaged, very highly recommended! Double bassist Margarida Garcia has worked with heavyweights like Chris Corsano, Loren Connors, Marcia Bassett, Alan Licht, Otomo Yoshihide and Oren Ambarchi. As that list suggests, she tends to operate at the psychedelic end of the free music spectrum, making her an ideal accomplice for an experimental rock veteran like Thurston Moore. Listening to the record, the deep bowed, sub-aquatic moans and guttural grunts that Garcia coaxes from her instrument set the atmosphere of mysterious dread that dominates the disc. This elicits some exquisitely haunted guitar playing from Moore, who employs some serious tremolo arm abuse to make screaming notes cascade and trail off into wailing harmonics. Even when Moore is at his most textural and abstract, Garcia keeps things dark and foreboding, pushing this until her amp becomes a portal to some tentacled Cthuluesque abomination when things get heated. (...) for those who enjoy the darker, more exploratory end of underground music, there’s plenty of thrills and spills to be had here. The Rust Within Their Throats was released earlier this year, and is Moore in ‘abstract guitar experiment’ mode. In a duo with Margarida Garcia – a Lisbon-based sound artist who has also worked with Chris Corsano, Loren Connors, Alan Licht and many more – his work on this LP takes the form of two side-long pieces. Moore (on electric guitar) and Garcia (on electric double bass) create yawning, claustrophobic caverns of sound, the original instrumentation only partially recognisable beneath hefty waves of echo, feedback and stretched, detuned stringwork. It’s at time reminiscent of some of the pieces included in the SYR series of Sonic Youth records, but it feels more confident and focussed. I became aware of this album while doing something else on the internet – as is so often the case – and it led me to Headlights Recordings, one of countless shadowy experimental record labels that have a lot of product, and that seem to always have existed as something completely outside of any semblance of a mainstream music industry. Bassiste, contrebassiste et guitariste qui œuvre principalement dans les musiques improvisées depuis plus de dix ans maintenant, Margarida Garcia est une musicienne que je connais peu et dont on ne parle pas beaucoup malgré ses collaborations avec des artistes de renom (Mattin, Alfredo Costa Monteiro, Andrew Lafkas, Ernesto Rodrigues, Ferran Fages et même Thurston Moore tout récement). 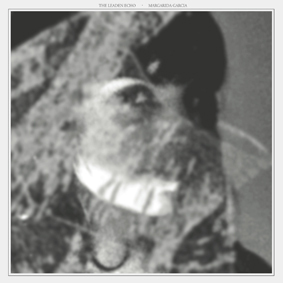 C'est Manuel Mota, sur son label Headlights, qui publiait le premier solo de cette musicienne en 2012, une seule face d'un LP intitulé The Leaden Echo. Pour cette suite de deux pièces d'environ dix minutes chacune, Margarida Garcia utilise une contrebasse électrique seule, sans effets ni techniques étendues. Il pourrait s'agir de réductionnisme, mais ce serait réducteur d'en parler ainsi. Margarida Garcia a développé ici un langage simple, mélodieux, lancinant, et mélancolique. A l'archet sur la première pièce ou en pizzicato sur la seconde, Garcia développe un chant d'une beauté ensorcelante. Des notes simples, espacées, distantes, et surtout intenses se suivent les unes les autres dans un timbre proche de ce que beaucoup d'entre nous imaginent en pensant au chant d'une baleine. De longues notes résonantes, graves, profondes, des cris doux qui envoutent, bercent, émerveillent. Margarida Garcia propose une suite de deux pièces où la contrebasse se fait le médium d'un chant unique, un chant primitif et animal 'une certaine manière, mais également subtilement poétique et raffiné. Solo de longues notes qui se répondent, d'harmoniques qui résonnent et forment un espace imaginaire et poétique, d'une femme et d'un instrument qui chantent la poésie du monde, d'un espace, et d'une espèce. Le chant lancinant d'une femme qui fait de la poésie subtile avec son instrument. Le chant d'une artiste qui veut chanter le monde, la contrebasse, et soi-même. Un travail très original sur la contrebasse, un travail voluptueux et poétique, subtil et profond, mais surtout beau et envoutant. Vivement conseillé. Of a totally different nature is this little gem by Portugues bassist Margarida Garcia, a 200 copies one-sided LP of seventeen minutes. The sound of her bass resonates like I've rarely heard a bass resonate, filling the space completely, with long bowed tones that make every nerve in your body vibrate in harmony, whether very deep or very high, it is sad, eery moaning and terrifying at the same time, hard to capture in words (luckily!). 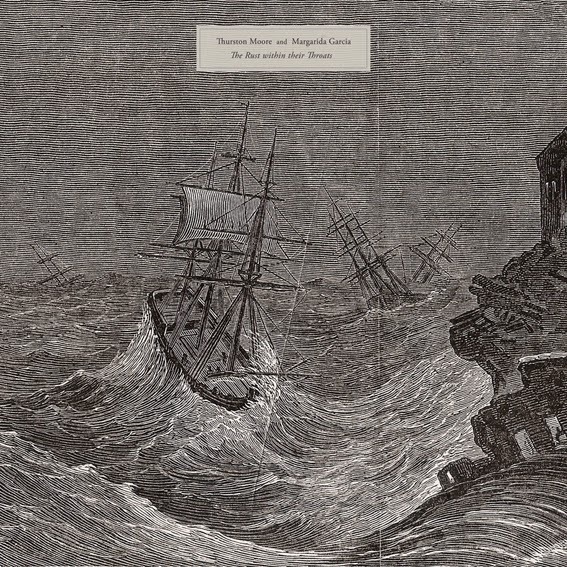 The second piece is played pizzi, but with the same calm and sober power, creating a desolate sonic universe that is compelling and unique. Contrebassiste soucieuse du son, du silence et de l'amplification, Margarida Garcia nous livre ici un solo d'une seule face où la distance de la prise de son crée une sensation de flou, l'impression d'écouter l'enregistrement d'un phénomène autre que celui issu de l'instrument, le développement d'une matière informe sombre et distante, gluante et malsaine. Limité à 200 exemplaires. Recommandé. Margarida Garcia lives in Lisbon, plays bass and draws, always on the edge and looking for next. She describes her latest solo release,“The Leaden Echo”, as “Not Conceptual. Not Experimental. Not Technical. Not Clean. Not Cold.” - Let's talk together. Outdoors and insights : “I recorded while living in Brooklyn. The apartment was in Brighton Beach, and I mean right on it. Each time the sound of the waves were very present (something that is mirrored only by the hiss of the tape deck onto which I usually recorded everything). There was also fog, so that once in a while deep boat horns could be heard. Thinking back, that changed the way I played music then, for sure.” Each path is a line made of many other lines, “I did a lot of recordings both in New-York & Lisbon, but in the end, I found myself loosing track of the initial feeling that I was going for. I came back to the beginning, the first tapes I did with theses songs, it was short but it was all there and adding any other track seemed redundant. So I really had no choice but do it like this.” Repetitions & Differences,“I've always thought of the bass as being full of soloist possibilities and not just a support. I wanted to speak about the inner instrument, and what that would touch, involve, and reveal. With the background hiss, which was somewhat accidental, it gave me and it an outer frame, a room with a window to the outside. But a solo is a journey inside, immersing and closing, a self heart opening, while your ghosts are watching... Right now I am mainly interested in having the most expression with the simplest and most basic material but, I suspect there is not really such a thing as a basic material, there is just another scale of intrinsicness, complexness.” Some early hours too, “I began playing music in college, around 1996, starting with guitar... never had any lessons (well that's not exactly true). I learned with every musician I ever played with, and also with my favorite players and composers, listening again and again to their music, playing along with them, going to concerts, etc. In the beginning I was interested in all instruments or anything that made sound really, trying out different ways of approaching composition...but when I picked up the bass in 1998-99 or so that changed. I became more of an instrumentalist, I tried hard to give it full dedication, to learn the “proper way” to play it, hold it, and spent a lot of time with it everyday until I was able to hear something that sounded vaguely acceptable...” Daily thoughts, food for ears and hands, “I have been listening to the Dagar brothers. ZM Dagar just seems like he is singing his soul out. He plays a a Rudra Veena which is a sort of bass with huge frets for bending notes. It really strikes me how much meaning and weight there is in each note, is is like a whole thought or a whole picture. This is also present, the way I see it, in Loren Connors’ work, whom I was playing also by the time I recorded these tracks. His playing is so moving to me. Playing with him is like discovering another dimension in music, one that you feel only.” - Taking us back to “The Leaden Echo”, friends-home(s)-friends : “This LP was released on Headlights, a label from Lisbon owned by guitarist Manuel Mota. We met in 1996 and started playing together shortly after that. Since then he has been a huge inspiration as a musician and a human being, a solid foundation and a driving force for me, but mostly a great friend and an incredible supporter. He had asked me to do a solo for his label some years ago, but my urge to do it only came much later. So when the possibility to make the record came up, he produced it and helped the editing process. Barry Weisblat did the mastering. It is great to work with people that know you for years, that you trust...In this case two wonderful people that really understand what I wanted without any talking or explanation. Mutual respect and much kindness are main ingredients put in from these men, in cooking up this record”. Simply saying that “I play because it is my way of connecting and relating to other people and myself. Also it's my way of trying and wanting to give back what so many have gave to me, since always.” Oh Yes. I dischi per strumento solo sono sempre difficili da consigliare se non si è ben sintonizzati nel mood di chi li realizza; personalmente, uno dei (pochi) strumenti che non mi stancherei mai di ascoltare in ogni salsa è il basso molto meglio se acustico. La portoghese Margarida Garcia (incontrata spesso con Manuel Mota e i Curia) non sarà forse una virtuosa e neanche una rivoluzionaria ma il suo tocco è, se non altro, sensibile. Non suona note e accordi, emette droni e scie, filamenti scuri e tenebrosi, tocchi che si allungano a dismisura come flutuando in un mare di pece imperscutabile tra nebbie e silenzi profonsissimi, unica parvenza d'umanità scomposta e spalmata fino a diventare pura aria. Una musica che evoca annullamento e che nella sua non visibilità trova motivo di esistere. Non per tutti, anzi per pochissimi (200 copie stampate) e non esattamente sintonizzati con la realtà. As the name of the label implies, the releases on Manuel Mota's imprint are beams of light emerging from the surrounding darkness. But at times only just. 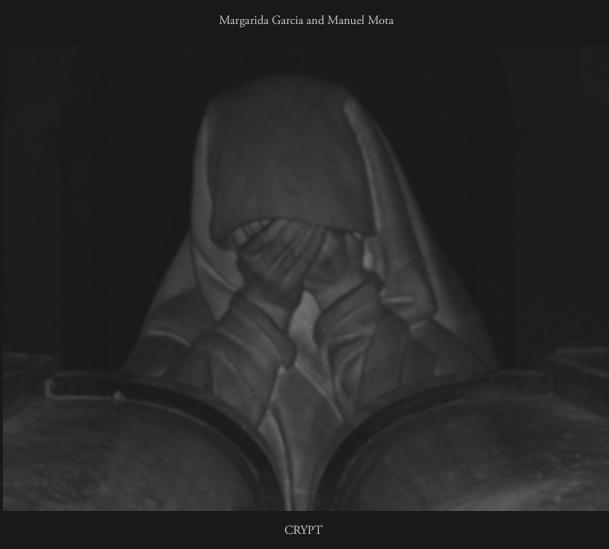 Bassist Margarida Garcia recently teamed up with another gaunt, spectral figure of new music, guitarist Loren Connors (Red Mars, Family Vineyard), and it was a perfect match. Here though she's all alone, ruck and wrinkle, drooping, dying, death's worst, winding sheets, tombs and worms and tumbling to decay. 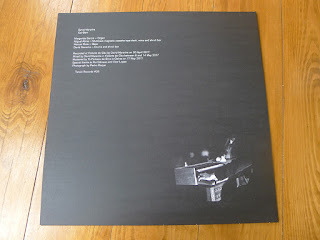 Arco on the title track, pizz on "Haunts", with Barry Weisblat's recording, which manages to sound muffled and reverberant at the same time, perfect for this discreet, at times painfully introspective music. What a shame it's just a single sided LP – perhaps there's another one (The Golden Echo?) on the way. Live in hope.